When I was twelve years old I made my first pie crust. An ornate lattice crust for a blueberry pie made in anticipation of my mother coming home from the hospital. I removed the pie from the oven and happily cut myself a slice. The filing was perfect, the crust however could barely be sawed with a knife and took considerable time and effort to chew and swallow. I did not grow up in a household where pie crust was ever made so I did not have any idea what I did wrong. I left my doorstop crust pie on the counter and went out to have lunch, my brother told me he would stay home and just have a slice of pie for lunch. I had lunch with my mother's old physics professor and he explained the science of crust making. As he told me pastry has to be handled as little as possible to keep it flaky and tender I thought of the hour I had spent watching "The Price is Right," as I rolled and rerolled my crust. I left lunch knowing that my next crust would be better and at least my mother would enjoy the filling in her welcome home pie. I still remember how my pie looked when I returned home, 2 slices neatly cut out and the insides scraped completely clean. There was not even a trace of blueberry filling remaining. I am sure that a screaming argument resulted, however I do not remember that part. What I do remember is my mother, who told me she loved the pie crust I made for her. Then every night after dinner she cut herself a slice of crust until she had eaten the whole tough monstrosity. That memory is one of my definitions of love, as well as a reminder to have a light hand when making pie crust. So you can imagine my thought process as I looked for a pie crust recipe to use in the preschool at work. The crust I ruined that very first time became my favorite crust when handled carefully. However I do not feel a group of overly enthusiastic three and four year olds would be best suited for preparing a delicate crust. I do believe in process over product for many things in the preschool setting, but food prep is not one of them. So I searched for a crust you can smush into the pan with no rolling. The crust I found calls for oil and all you do is stir it before pressing it into the pie pan. Skills that seemed perfectly suited to preschoolers, I figured the results would be better than a crust that might be rolled for 20 minutes. 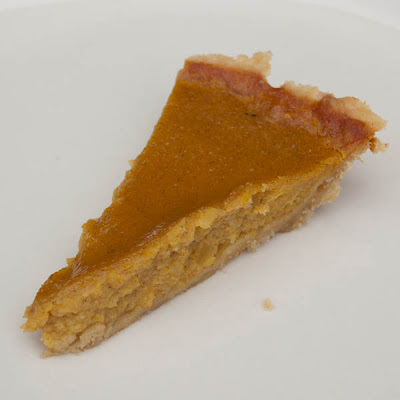 I was very happy with the crust we made, it was better then any I have found in the freezer section, although I feel a need to point out every bite of crust was filled with pumpkin pie, so really my results are skewed. However I am now thinking quiche could be a fast weeknight meal utilizing a crust that is stirred and smashed before filling. I have already told my boys they can make the pumpkin pie for Thanksgiving this year. The filling was also just what I was looking for, although part of that is starting with pie pumpkins instead of a can. One coworker remarked, as she took her fourth piece, "I don't even like pumpkin pie, but I love this." I am guessing she never had a pumpkin pie made with fresh pumpkin before. 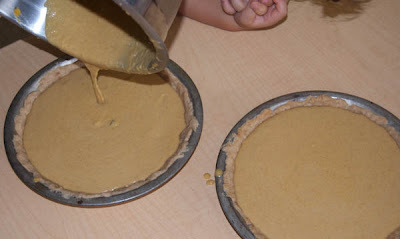 When I entered the classroom with the baked pies one little girl enthusiastically asked for a piece of pie. As soon as she was done she was asking for more. I asked her to please wait until everyone had a first piece. She sat quietly down and slowly licked her plate clean, and to be honest I don't blame her. Since then I have had the chance to cook one more time with the preschoolers. I escorted a small group of them to a local farm where we picked kale. Then we returned to the classroom and made my recipe for kale chips. When we sat down to taste them most of the children excitedly gathered around ready for their turn to taste them. One little boy made a face and looked at the bowl with disgust, although he did cautiously take one from the bowl. He bit into it and then quickly ate the whole thing. He said, with wonder "I didn't think they would taste yummy, but they taste really yummy." Then all but 2 children proceeded to devour the whole bowl. Personally I am still doing mental cartwheels of joy over the whole thing, 3 days later. Mix all the ingredients together in a bowl. We chose to divide the dough into 2 balls before pressing them into pie pans. We had just enough dough for a thin crust in each pie without an extra lip of unfilled crust. Line the pie with foil and fill with about 1 cup of dried beans or pie weights. Bake the unfilled pie crust in the center of the preheated oven for 20 minutes. Remove and fill with desired filling and bake according to filling recipe. Split the pumpkins in half and scoop out the seeds and strings. If the pumpkins are very hard to cut through use a large chefs knife or cleaver and a mallet or hammer. Just place the knife on the pumpkin as sharp side down and tap it with the mallet to slice the pumpkin in half. Rub all the cut surfaces with olive oil and place cut side down on a cookie sheet. Bake until tender when pierced with a knife through the skin. You can scoop out the insides now or place in the fridge until needed. Use a spoon or grapefruit spoon to scoop all of the pumpkin flesh into a bowl or pot. 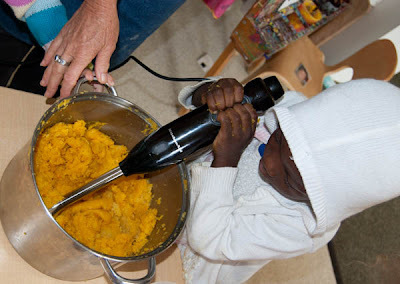 Use an immersion blender to puree or place in a blender or food processor and process until smooth. Any puree not used in the pie can be used in muffins, pumpkin waffles, soup or frozen for later use. Preheat oven to 375° Whisk all the ingredients together and pour into crust that has been blind baked for 20 minutes (baked without its filling). Pour filling into single pie pan and bake for 45 to 50 minutes until filling is set but still jiggles when you shake the pan. Allow to cool on a rack before serving to allow filling to set fully. I love that you even cooked fresh pumpkin instead of using canned. Lucky, lucky preschoolers to be learning about real food with you! This is such a great, helpful post, but what I love about it most is the story about your mom. It is so beautiful, I cried reading it. Thanks for reminding us about what it means to love our children and accept their offerings of love to us! Adorable! I used to love cooking at my daughter's preschool. A pie crust that can be pressed in is wonderful. Perfect for a lazy baker like me. I've never baked a pie crust and would likely use beans as a weight in one. Can I cook the beans after I've baked them, or will I just be composting these after? 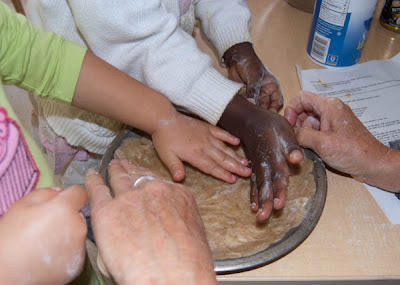 When it comes to kids it doesn't matter how professional the crust is but how much they have enjoyed the whole procedure and how many things they've learned about the value of homemade food and you certainly taught them these. Great job. I always say pie crust is an art and you either can make it or you can't. I am a can't, but willing to try again, thanks for your recipe and tips. What a wonderful post!I miss cooking with children and I love your photos of them making the crust and filling.if you won't mind I'd love to guide Foodista readers to this post.Just add the foodista widget at the end of this post and it's all set, Thanks! Katherine, You would just be composting the beans after baking, or you can use them for collages with the kids. To be honest I just made more of these pies on Friday and I did not bother with the beans. I had no problems, no puffy crust etc. Great! Thanks! I LOVE not bothering!